Missouri Martin: So you think you're through huh? What about the husband she's supposed to have? Missouri Martin: The honorable E. Worthington Manville. Who's going to dig him up? Dave the Dude: Gee, I forgot all about the husband. Director Frank Capra single-handedly put the then fledgling Columbia Pictures on the major studio map in 1933 with the release of Lady For A Day, which took four Academy Award® nominations, the first ever for the studio. While it failed to win, it promoted Capra into the upper tier of directors, and set the stage for an impressive sweep the following year. This was sealed with 5 Oscar® wins for Capra's followup, It Happened One Night—a first for any film—for Best Director, Best Film, Best Writing and statuettes for both leads. Capra would return to the podium to receive Best Director honors for Mr. Deeds Goes to Town (1936), and You Can't Take It With You (1938), which also earned him his second Best Picture Oscar®. After a string of successes including Lost Horizon and Mr. Smith Goes to Washington, Capra left Columbia for Warner Bros., where he would make one of his most critically acclaimed films, Meet John Doe. After World War II, Capra split from Warner, forming his own Liberty Pictures with George Stevens and William Wyler, where his most beloved picture today, It's a Wonderful Life, was made. At the time however, It's a Wonderful Life was a box office failure, and it was only after the picture fell into the public domain that its availability as a freebie to TV stations propelled its popularity to classic proportions. In 1961 Capra would shoot his final film, A Pocketful of Miracles, a color remake of Lady For A Day. Based on the Damon Runyon short story, Madame la Gimp, Lady For A Day was not only significant for its accolades from the Academy, but it also marked a turning point in Capra's directing style. Here, he began the use of overlapping dialogue that would become his trademark, penned by his longtime collaborator, screenwriter Robert Riskin—who, despite comments to the contrary on the box art and in the commentary, had been working with Capra since writing dialogue on Capra's 1931 Platinum Blonde. Capra would also accelerate the action onscreen, which resulted in more realistic scenes between his actors. His familiar underdog theme would be utilized again, this time focused on taking a woman from the streets and placing her in high society, in a fairytale-like story few could make us believe. It is the height of the Depression, and the effects can be felt down to the panhandlers. Despite their hardships, the spirits of these people are undaunted, as Apple Annie (May Robson) tries to make her way selling her fruit on the street. Her only family is daughter Louise (Jean Parker), who has been living abroad, and is unaware of her mother's plight—a situation embellished by the letters Annie writes her, on stolen hotel stationary, in which she describes her life as one of affluence and privilege. When Louise writes back saying she is bringing her fiancé, Carlos (Barry Norton) and his father, Count Romero (Walter Connolly), to America to meet her family, Annie is desperate that the truth about her life be concealed, to the point of asking the hotel manager (where she had gotten her letterhead) to say she is dead. Enter Dave the Dude (Warren William), a local gangster boss with a superstitious streak who believes the root of his success comes from buying apples from Annie. When he hears of the situation Annie has gotten herself into, he feels compelled to help out by putting Annie up in a hotel room and having his associates, led by nightclub owner, Missouri Martin (Glenda Farrell), make her over to pose as a lady. Despite trying to distance himself, in true Capra style, Dave is drawn deeper and deeper into the ruse, which includes the recruitment of a suitable husband (Guy Kibbee as pool shark Judge Blake) for the new" Lady E. Worthington Manville." When Annie's visitors arrive, it is all everyone can do to maintain the illusion, as the local press and police swoop in to uncover what is really going on. Can Annie keep up the front and secure her daughter's happiness through marriage, or will the entire deception be uncovered? Lady For A Day presented some major challenges for the director, not the least of which was casting an older leading lady. Since the only well known candidate was inaccessable due to her contract with MGM, Capra hired veteran Broadway star May Robson, whose film experience was limited. His choice however was a brilliant one, as Robson steals every scene she is in. Dialogue is typically sharp and witty, and as the scenario moves from unbelievable to incredible, the comic level never retires. The supporting cast each carry their roles effortlessly, and small developmental scenes help the audience identify with their characters. Joseph Walker's photography is a joy to behold, from soft filtering to scenes shot through streaming water, each is set up for wonderful compositions, and remarkable depth of image. While the story may seem a bit too sugar-coated compared to modern films, it is this very nature that makes it such a pleasure to watch. For emotional impact and fantastic storytelling, this fairytale of the street vendor turned aristocrat is a wonderful treasure to discover. Truly enjoyable. Image Transfer Review: Lady For A Day represents a digital restoration that has resurrected the greyscale tonality and detail from the original prints; in this respect, it looks wonderful. It does, however, show its age in the frequency of specks and fine scratches, in addition to a number of jump cuts and increased grain during transitions. Much of the final reel suffered from three large, white blemishes, which dance distractingly along the right side of the frame. In addition, there are four or five sequences that suffer from encoding problems with the interlaced source, resulting in visibly merged frames. While I can overlook source defects due to the age of the film, the encoding errors are most unfortunate. Audio Transfer Review: Audio also shows its age with limited dynamic and frequency range, and a fair amount of edginess during scenes with a loud score. Dialogue is easily discernable throughout, and is free of excessive hiss. Despite its weaknesses, this still stands up as above average for its vintage. 1 Feature/Episode commentary by Frank Capra Jr.
Introduction by Frank Capra Jr.
Extras Review: Director Frank Capra's son, Frank Jr., adds the two supplements to this release. The first is a video introduction to the film, encoded as the opening chapter for the feature. The second is his feature length commentary which, while referencing the film at several points, is more of an introduction and overview of his father's work. There is a suitable blend of film-specific information, such as the casting process and production style, combined with information covering many of Capra Sr.'s more famous works. The crew present during the taping of the commentary also get involved about halfway through, and can be heard, though not very well at times, prompting Frank Jr. with questions. There is a lot of interesting information contained here, and the track is certainly educational. 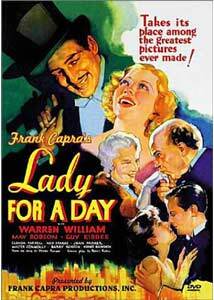 Lady For A Day was the prototype for the famous Capra style, and its emergence here on DVD affords audiences a chance to rediscover this brilliant and witty fairytale from one of Hollywood's foremost classic directors. The acting is grand, the story delightful, and the visuals striking. For a good, old-fashioned comedy of "airs," a steet vendor enlists the help of her friends to pull off a deception that will ensure her daughter's happiness with the apple of her eye. Always on the brink of disaster, Capra works his fantasy magic, in this wonderfully uplifting film. Recommended.